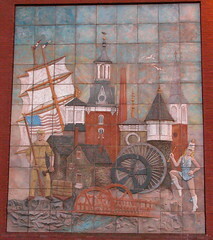 This frieze, mounted on a north facing exterior wall of the Hampden Elementary School represents a highly idealized view of Hampden's heritage. A collection of mill cupolas, water wheels, and billowing sails make up a background on which two figures - a hammer-wielding soldier and a baton-twirling cheerleader - promenade. I find it to be an interesting piece of public art for a number of reasons. First, it is an attempt to link Hampden's past as a mill town that produced cotton duck (sailcloth) with its present through the landscape. Second, the cupolas and belltowers are, of course the most prominent architectural feature of most indistrial buildings. They are also instruments of control - the public timekeepers that divide and regulate the workday. Third, is the portrayal of the roles of men - soldier/workers - and women -cheerleaders - which is at odds with Hampden's historical reality, where women composed as much as half of the workforce. This frieze is, I think, a great jumping -off point for an analysis of Hampden. As a public portrayal of an idealized version of Hampen's past, it shows us something about the pride that Hampdenits have taken in their industrial past, as well as some of the assumptions that underlie the popular interpretation of that past. Adding to Dave's interpretation of the mural, I think it's interesting that it portrays the patriotism of Hampdenites during times of war. While I don't wish to question this sense of patriotism, it's interesting that mill workers struck TWICE during the industrial build-up to World War I, when the AFL was loudly supporting the war effort and denouncing wartime strikes as unpatriotic. (At this time Hampden had a union local in the United Textile Workers of America, an AFL union.) What lesson are we to take from this? Does it simply mean that we can't always trust community memory? Or did Hampdenites consider these strikes to be a part of the movement for "industrial democracy," in a sense patriotically fighting for those rights at home that the military was fighting for abroad?